I have a few (or more) leftover stamped/coloured images from the Zoo Crew set from Paper Smooches. I decided I wanted to make a little tag. It didn’t quite work out like I had in my mind but hey, it was fun to make. I had started with a pretty blue background but it just got lost so it was back to this gorgeous green cardstock from American Crafts. It gave the card so much more POP! 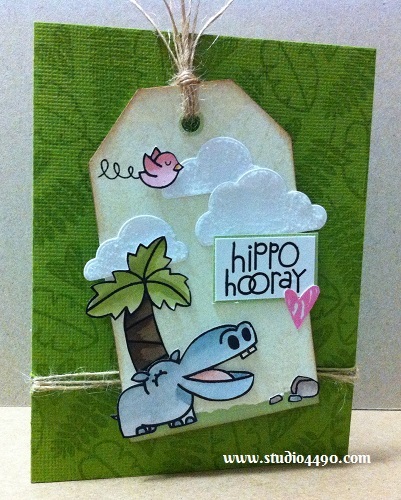 Materials used: Cuteasaurus, Zoo Crew (Paper Smooches), Home Sweet Home (Lawn Fawn); Cardstock – American Crafts, Knight; Distress Markers (Ranger); Lawn Cuts (Lawn Fawn); Distress Stickles – Rock Candy (Ranger); and Twine (Maya Arts). Even when I don’t love my final creations, and I know you’ve all heard me say that a few times now, I really do enjoy the process and ultimately, I think that is what it is all about. Eeeeee…what a darling, sweet, delightful tag/card! Don’t you just want to give that wee hippo a hug (and I’d love to have one that size for a pet!). Background, tag, colouring, layout – it’s all fantastic!! You’re inspiring me to play with my Zoo Crew set! BTW, have you checked out the latest PS challenge: sheer and clear? I have my thinking cap on; hopefully you’ll have a chance to play, too, because I know you’ll make something fabulous!! Have an excellent Tuesday! I’m hoping for some card making time, but my folks have a whole X 10000 number of errands lined up for me (window washing being one…I don’t mind, but you can imagine how I obsess over making sure not a streak can be seen!!). Looking forward to your next dazzling creation! Hi C, if it stayed that size, yes, I’d definitely want one as a pet too. haha Such a cute stamp. PS has the cutest images and you *must* drag out your Zoo Crew set and play with it too. I have seen the new PS Challenge but haven’t really given it much thought….maybe this weekend. Thanks for the encouragement! 🙂 Oh errands…boo! Don’t they just get in the way of all the fun things?! lol Oh but they do need to be done. 🙂 Hope you fit in some play time amongst the chores!